Spring semester classes ended a week and a half ago, and I finished all my grading fairly quickly. I spent most of last week relaxing as best as I could, though looming in the back of my mind was a concern about my summer course and whether or not it would be canceled due to low enrollment. The maximum number of students I could have is 30, and at one point it was as high as 27. Then, within the last few weeks, they plummeted down to 13 - not good, because my coordinator had told me that the course would be canceled if it went under 15. Then she said it was 10, and I contacted her again when my numbers dropped to 8. Then she said it was 5, and since then it's held strong at 8. It was a stressful situation, first because a canceled class would mean no paycheck, but also because if I didn't need to be here to teach, I'd be moving sooner. Luckily, though, it all resolved itself, and today was the first day of classes. A class of 8 presents unique challenges: class time tends to go by faster with fewer kids to discuss and share, so I have to be mindful of that in my lesson planning. On the positive side, though, grading will be quicker! Besides worrying about work stuff, I spent last week applying for jobs in Chicago and working out. I found my absolute dream job and have my fingers crossed for that. I also joined a gym that's a few miles from my apartment, just a 30 day pass but good to stay active this last month or so. I've missed the elliptical so much! The tough part is that I can't wear myself out as much as I would like in a workout because I know there's either a 2 mile walk or bike ride home after (plus the 2 miles of getting there to begin with!). It isn't too bad though, I'm just glad to be back in a workout routine. Just running/biking had me in a rut lately. I won't be taking my bike to Chicago, I know I'll miss having it as an option. But I've put in thousands of miles on the same 20 mile loop, and I was feeling bored, dreading working out. To close out my week of summer break, I headed up to San Francisco with Angela, one of the filmmakers working on the Ragnar documentary project. 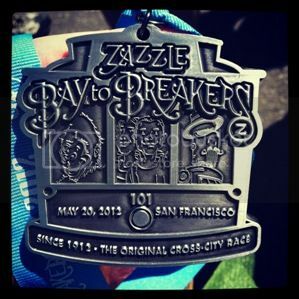 I was planning on participating in Bay to Breakers with Marisol, and she wanted to film some of the experience. We got to the city on Saturday afternoon and I hit the expo to grab my bib, then we grabbed dinner at a great little place and called it an early night since we had to be out the door at 4:50 the next morning to catch our shuttle to the start line. There were several shuttles, and in an amazing twist of fate, Marisol and I ended up on the same one, so we got to meet right away. It was so wonderful to finally hang out with her - she is incredibly inspiring, not to mention totally sweet, and has been an amazing source of support since I moved to California, since she used to live near where I am now and understands some of my frustration with the place. It was a brilliant day - it felt incredibly comfortable, too, which was great. When you read someone's blog, especially with health and fitness blogs where we're so open about struggles, you get this feeling like these people are your good friends. And that was what this felt like - it didn't feel like meeting for the first time but rather, reuniting with someone you've known for ages. I couldn't have been happier. The race was huge - over 40,000 people - and is really more of an event than a race. 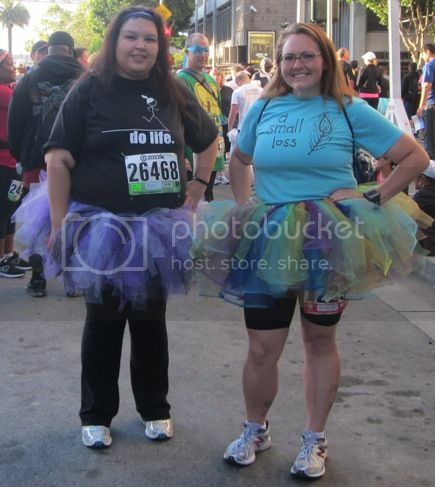 There are tons of people in all sorts of crazy costumes, and we did our part by wearing tutus. 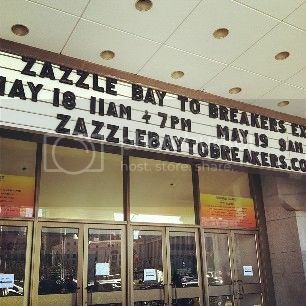 My favorite costumes, though, were the salmon who "swim upstream" - they run from the Breakers to the Bay. Brilliant! We kept a good pace for the whole route, about 7 miles or so (12K), including a long hill with a very steep incline. We survived it! And at the end, we got awesome medals for our hard work. Score! And it was totally hard work - between the race and then another 3 miles to catch my bus to the train home, my legs were absolutely exhausted. I rode my bike a little today to stay active because I knew running or the elliptical would knock me out - I attempted a long run a few days after walking 10+ miles per day in San Francisco with Matt in January and had to stop mid-run because my legs were killing me. The tough part of San Francisco walking isn't just the distance but the hills, and I have much respect for anyone who runs/races there regularly! Walking around the city, even just for a day, made me incredibly homesick. Between being in a city and missing the atmosphere, and seeing places I visited with Matt and missing him, it made me ache for my beloved Chicago. The countdown calendar is shrinking, so that's a good thing!